Indie developer thechineseroom's experimental first-person adventure Dear Esther was a runaway success, despite the fact that wonderfully moody and atmospheric experience wasn't exactly what one might consider a game. Now that they've set the mood, it's time to add in a bit more game with Everybody's Gone to the Rapture, the story of the end of the world and the inconveniences that might cause. In keeping with the isolated nature of Dear Esther, this isn't the end of the world on a global scale. Rather it's the end of the world in a tiny English village in Shropshire. It's a tight-knit community that keeps to themselves, so when God starts calling everybody home they aren't exactly at the front of his little black book. "The concept of it is this almost '60s-'70s Brit science fiction – this John Wyndham, John Christopher kind of thing – of how the end of the world would be responded to in a rural English location," explains creative director Dan Pinchbeck. "It's kind of like that film that was made after the Second World War about what would have happened if the Nazis had invaded – and actually, the film was so controversial because not a lot would actually change for the vast majority of people, or they'd just accept it really, really easily." There's definitely more game here than there was in Dear Esther, which really just featured a lot of walking. In Everybody's Gone to the Rapture the player will be given an hour to explore the village, interacting (or simply watching) six different characters (or memory traces of those characters) going about whatever business they might have at such a time. The player will be able to affect the story through interaction, opening and closing doors, discovering hidden places, or by simply standing there, letting events unfurl. Whether you choose to or not is a different matter. It's perfectly feasible, says Pinchbeck, to play Rapture by standing still in the middle of the world. The game's characters will continue to follow their own path, and their actions will still change the world, so you'll still get to experience a story even if you decide not to participate in it. With only a single real-time hour to experience a slice of humanity's end, Everybody's Gone to the Rapture is the sort of game you'll want to play again and again, sharing your experiences with other players. It all sounds very transcendent, much like Dear Esther, only with more freedom to shape your personal experience. 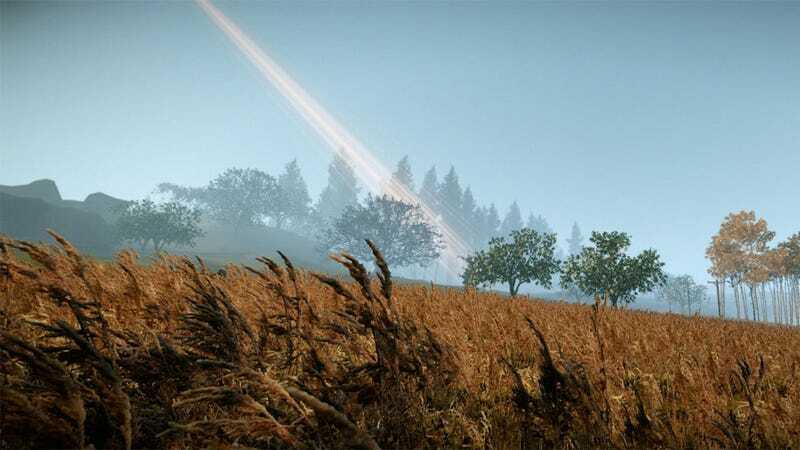 Everybody's Gone to the Rapture is coming to the PC in 2013. Hit up the link below for more screens and info.